Tide-pool critters can withstand the harsh environment in which they live, but they are very vulnerable to human activity. Please observe the following tide-pool etiquette, so our intertidal critter friends will survive your visit! Please walk cautiously...avoid stepping on critters whenever possible. Handle intertidal animals very carefully...poking, pulling and prying can cause injury or death. If you do pick up a critter, please return it to the same place where you found it. These little guys are so specialized, they may not survive in another location only a few feet away. When moving rocks or plants to get a better view, replace them just as you found them so exposed animals won't dry out. Take only photos and leave the critters for other tide-poolers to enjoy (they probably won't survive if you do try to take them home). Remember Biology class and the categorization of plants and animals? (Domain, Kingdom, Phylum, Class, Order, Family, Genus, Species.) The following animals and plants are found in the intertidal areas of the southern Oregon coast. The bullet items first list the "Phylum" followed by the"genus" (listed inside the parenthesis) of the animals and plants. WHAT ARE THOSE STRANGE CREATURES CLINGING TO THE ROCKS DURING A LOW TIDE? 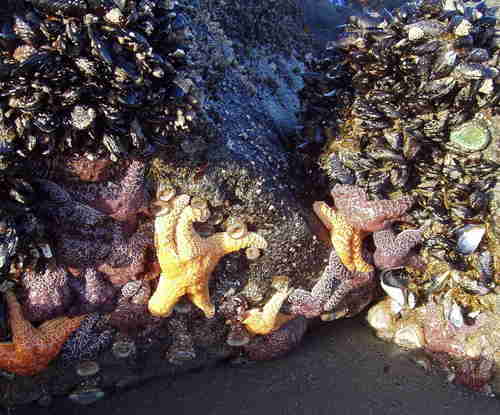 The purpose of this website is to help identify the unusual intertidal (between the tides) animals that might be discovered when exploring the rocky shores of the southern Oregon coast during a low tide. I hope the photos and the accompanying descriptions of these animals and a little information about each one of them will encourage you to explore the tide-pools and rocky intertidal areas of this remote southwestern corner of Oregon. Click on each category (top right sidebar) and scroll down to see the various intertidal species. As the tide goes out, water is captured in crevices and holes, creating large and small tide-pool "aquariums." If you keep very still and look closely, you will probably see some very interesting creatures in these unique habitats. The bright orange frilled animals in the photo are Red Sea Cucumbers (Cucumaria miniata), the purple spikey animals are Purple Sea Urchins (Stronglyocentrotus purpuratus), and the green flower-like animals are Giant Green Anemones (Anthopleura xanthogrammica). A very low-tide also provides access to rocks and caves, normally covered by water during a high tide. In addition to the large, bright sea stars (they aren't called starfish any more!) in the photo below, there is a multitude of other animals clinging to these shear rock faces, waiting for the tide to reverse. 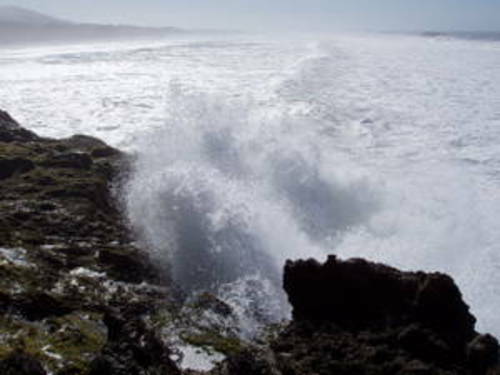 Intertidal organisms have to withstand harsh and varied environmental conditions: pounding surf (see below), hours without any water at all, baking sun, voracious predators, and copious amounts of rain diluting the salinity of smaller tide-pools during low-tides. The unique, resilient intertidal species are specially adapted to these brutal challenges. The southern Oregon coast has huge populations and a wide diversity of intertidal species waiting to be discovered...come and explore!